"Announcing his refusal to meet with Venezuelan President Nicolas Maduro and reiterating that military intervention is a possible option, Trump acknowledged that he is the main instigator of the coup against the [government] of Venezuela," Morales wrote on Twitter. 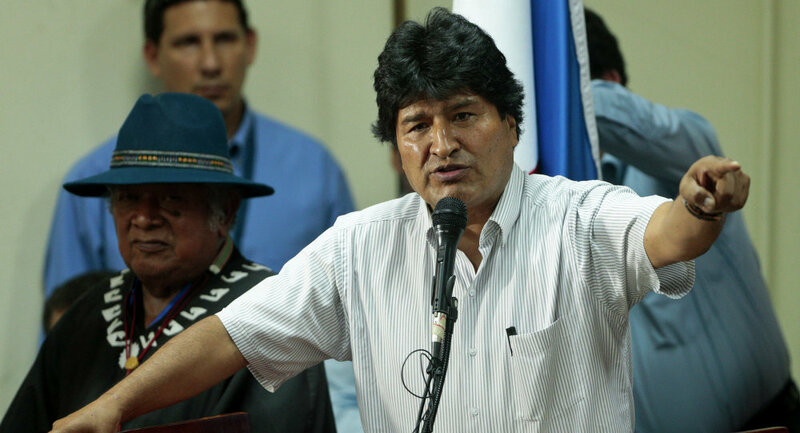 — Evo Morales Ayma (@evoespueblo) 4 февраля 2019 г. He noted that "free peoples and governments" demanded dialogue for peace in Venezuela. On Sunday, Trump confirmed in an interview for the CBS broadcaster that US military intervention in Venezuela was "an option." Earlier in the day, Spain, Austria, Denmark, Finland, France, Germany, Latvia, Lithuania, the Netherlands, Portugal, and the United Kingdom recognized Venezuelan opposition parliament speaker Juan Guaido as the country's interim president. The moves came after the deadline set by the European Union for Maduro to announce snap a presidential election elapsed on Sunday. EU countries were expected to recognize Guaido in a joint statement on Monday, but, according to a diplomatic source in Brussels, Italy blocked the statement. China, Mexico, Russia, Turkey and Uruguay were among the countries that have voiced their support for Maduro.